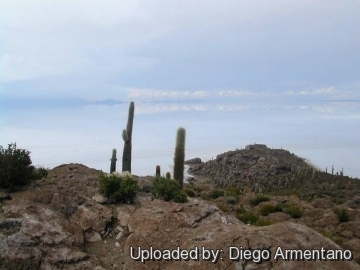 Isla del Pescado or Incahuasi island, in the Salar de Uyuni, Potosi, Bolivia. Magical place. Altitude: 2000 to 4000 m above sea level. Habitat: It grows on step slopes in association with shrub species and is often the dominant plant at the margins of the Argentine Puna. Ecology: The plant has narrow ecological requirements, and cannot tolerate hight humidity, extreme heat or enduring frost. 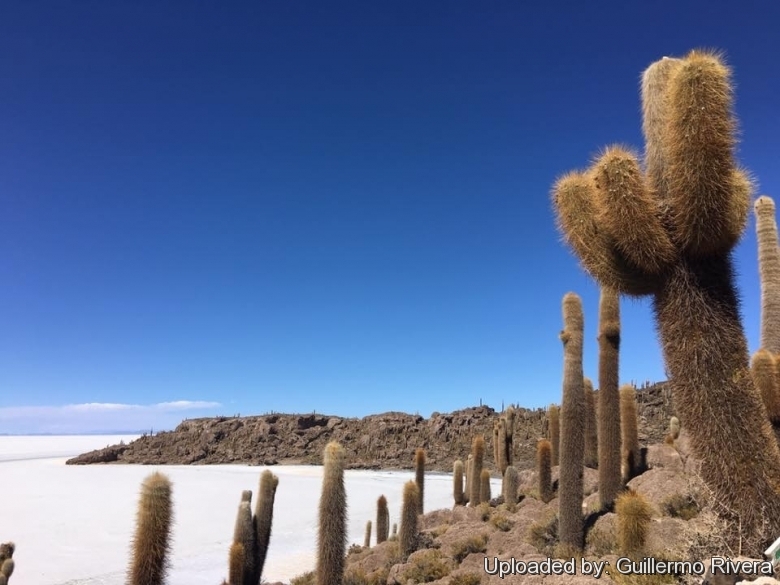 They appears to be intollerant of temperatures below -9° C or in excess of 30° C. Plants at higher altitude show dense coats of white fluff as protection from frost and sunburn. The climate is arid, rainfall 150 ± 70 mm per annum mainly from spring to autumn. Mean maximum and minimum temperatures winter are 30 °C and 8 °C, and winter are 27 °C and ?7 °C respectively. Throughout the year, there is a high diurnal thermal amplitude, of over 20 °C. Pollination is done by bees. Helianthocereus pasacanus (F.A.C.Weber ex Rümpler) Backeb. Cereus atacamensis Phil. in Phil. Echinopsis atacamensis subs. pasacana f. brevispina hort. Echinopsis pasacana f. brevispina hort. Trichocereus pasacana f. brevispinus hort. Echinopsis atacamensis subs. pasacana f. cristata hort. Echinopsis pasacana f. cristata hort. Trichocereus pasacana f. cristatus hort. 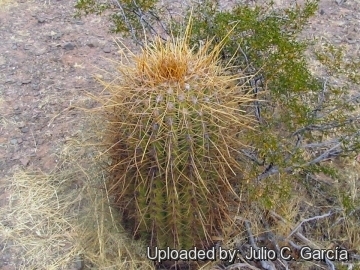 Description: Echinopsis atacamensis subsp. 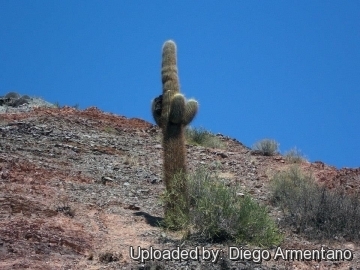 pasacana is a massive tall tree-like cactus with a strong branched habit that distinguish it from the subsp. atacamensis that is usually unbranched and less tall. Stem: Columnar, cylindrical, stout, 30-80 cm across that grows very slowly up to 10 m tall in a life span that may stretch more than 300 years. The stem stays for a long time solitary but produces lateral branches and becomes Saguaro-like with age. Larger stems my weight several tons. Areoles: Brown becoming large, round that produce at once a whole spine cluster, but the areoles remain capable of further growth. Many years later new spines may be formed from the upper part of the areoles. Spines: (30-)40-50(-100) quite variable in different specimen, unequal, hardly distinguishable from radials to central, subulate, rigid to flexible, amber, yellow-brown or dark-brown coloured, the longest up to 30 cm long, but usually less than 10 cm long. Flowers: Borne on the sides of the stems, rose-white, 10–14 cm long; Tube covered with long blackish hairs. Blooming period: Spring to summer, flowers open in the evening and last from 18 to 40 hours. Fruit: Dark green, densely covered with hairs, up to 5 cm long, edible. Echinopsis atacamensis (Phil.) 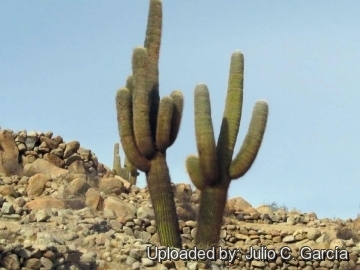 H.Friedrich & G.D.Rowley: Tree-like columnar cactus up to 7 m high. Usually unbranched or few branched, cylindrical stems have many deep ribs with brown aureoles, each bearing 30 to 40 spines up to 10 cm long. Distribution: Chile. Echinopsis atacamensis subs. pasacana (F.A.C.Weber ex Rümpler) G.Navarro: Often branched, attaining heights of 10 m or more. Distribution: Argentina and Bolivia. Echinopsis atacamensis subs. pasacana f. cristata hort. : Crested form. Echinopsis rivierei (Backeb.) H.Friedrich & G.D.Rowley: A tall columnar plant, rarely branching, up to 2 m high. Branches with many distinct ribs, areoles woolly with long white spines. grows on the Chilean side of the Andes, the other found over the cordilleras on the Argentine side and called pasacana. But if the two were growing side by side it would be difficult to say which was which and some authors affirm that they are one and the same. 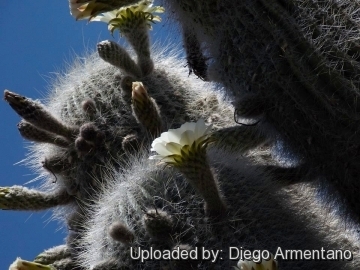 Moreover Echinopsis atacamens is considered by some authors only a higher altitude variant of Echinopsis terscheeckii. Cultivation and Propagation: It grow slowly and are moderately cold hardy, but make sure that they are not exposed to severe freezing temperatures, or they may die. They need a well drained soil mix. Water regularly in summer but allow to dry fully before watering again. During the winter months they should be rather kept dry. Since they are big-sized plants, they need plenty of space for their roots. Repotting should be done every other year, or when the plant has outgrown its pot. Propagation: From stem cuttings (if available) in spring (let them dry till the ends callous well. 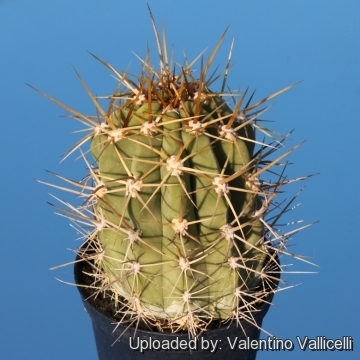 Then replant them in fresh cactus soil that is ever so slightly moist, and keep it that way till they root) or preferably by seeds. Seeds should be sown in a well-drained soil mix. Surface sowing is the best. Seeds germinate in 14-28 days at 20° C .
Traditional uses: A popular item sold in many regions of the world is the rain stick, made from the dried skeleton of the stem of the cardon, Echinopsis atacamensis subsp. 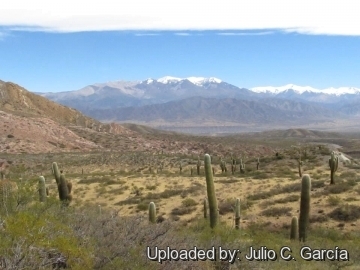 pasacana, in northwestern Argentina. The dry stems are harvested in the field, cleaned, and prepared by pushing stout spines through the areolar gaps in the wood. The cylinders of the wood are sealed and filled with various materials, such as volcanic sand or pebbles, that run up and down when the stick is tilted. These are then sold locally and overseas. The trade in rainsticks made from cacti has increased in recent years, giving rise to concern over the impact on the wild populations. 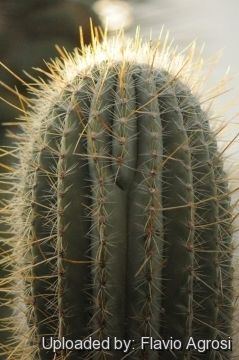 Rain sticks are also made from the wood of Echinopsis chiloensis or Eulychnia acida, in Chile.